There’s no question that writer/director Dan Gilroy has a gift for building suspense and crafting compelling characters. 2014’s Nightcrawler, a tale of a would-be camera-man selling videos of car crashes and mayhem to a struggling local news team, blurred the line between horror and suspense; creating a world that danced the line between Hitchcock’s Psycho and Scorsese’s Taxi Driver with Mary Harron’s American Psycho. Gilroy’s follow-up to that film and 2017’s critical darling Roman J. Israel, Esq. is 2019’s Velvet Buzzsaw, which just debuted at Sundance this past week and on Netflix, February 1st. Buzzsaw is ostensibly the story of a hipster art scene revolving around the Haze Gallery, a gallery owned by ex-punk rocker Rhodora Haze (played by Nightcrawler star Rene Russo with aplomb), who was formerly known as punk rocker Velvet Buzzsaw in the 80’s. Rhodora is always on the search for the next big thing in the art world and to that end courts the opinion of art-world critic Morf Vandewalt (Jake Gylenhaal). Morf has a complex relationship with Rhodara’s assistant Josephina (Zawe Ashton), who he once had a fling with, and Rhodara, who wants Morf’s favor for her gallery at any cost. The relationship only becomes more complex when Josephina discovers a treasure trove of paintings by a dead man in her building named Vetril Dease. As Haze and Josephina ensnare Morf in their bid to make Dease’s work “the next big thing” in the art world, the trio doesn’t realize is that Dease’s work has a seeming destructive life and agenda of its own. Gilroy’s send-up of the art world is a heavy-handed satire bordering the line between parody and farce. In many ways it reminds this viewer of the 1991 Sally Field and Kevin Kline comedic vehicle Soapdish, exploring the behind-the-scenes world and politics of the world of soap operas. Velvet Buzzsaw is crawling with comedic art world stereotypes populated by actors such as John Malkovich, Toni Collette, Tom Sturridge, Billy Magnusson and Daveed Diggs. At the same time, the subplot regarding Dease’s art feels like something out of the Twilight Zone by way of the Japanese horror film, Ringu. While Gylenhaal and Russo’s performances serve Gilroy’s narrative well, the film suffers from an uneven tone and uninspired cinematography and visual effects. 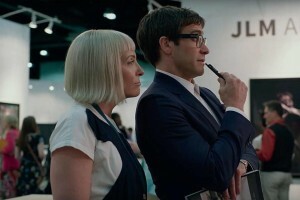 Velvet Buzzsaw’s odd lighting and photography choices undercut many of the film’s setpieces; particularly 2 elaborate death scenes near the film’s climax. While I think the film was aiming at a level of satire akin to that of the sendup of Hollywood in David Cronenberg’s Map To The Stars from 2014, it comes up short and sadly predictable by the film’s ending. While the film is worth a watch (especially for a cool setpiece near the end with shades of Don Coscarelli’s Phantasm), it struggles to come to the level of quality of Black Mirror episode, let alone something like the Twilight Zone. FINAL TAKE: Solid performances aside, the film’s convoluted tone and voice make it difficult to see this film as being something more than a bizarrely comedic morality play.